Winner of the Wallace Stegner Prize in Environmental Humanities. This book tells the story of how a group of local citizens in a remote part of Wyoming was able to start a movement that resulted in a negotiated buy-out of natural gas leases in their home mountains. Lushly illustrated with color photographs, it portrays the Hoback Basin as an important area for wildlife and a way of life for people. When two unforeseen events shatter Agnes Clayton's contented life, unfinished business from her past reverberates into the present. After losing her job as a school teacher, she learns that her father Clayt, a retired forest ranger, must vacate a historic ranger station that is about to be torn down. She hasn't seen him, or the place where she grew up, for twenty years, and she intends to make her stay as brief as possible—plans that crumble from the start. A community effort to save the War Creek ranger station ensnares her and she meets and falls in love with Hunter Swann, a wildlife researcher who is tracking a recently reintroduced grizzly bear. As she researches the ranger station's history, she discovers long-hidden secrets about her eldest brother's early death, the child she bore as a teen, and reasons why her mother abandoned the family soon after. Agnes fights to overcome her father's pugnacious refusal to cooperate with efforts to save the ranger station or to provide information about the past. Hunter is remote and self-possessed. As winter approaches he heads into the backcountry in search of the bear's den and is killed in an avalanche. In her grief Agnes finds the trajectory of her life irrevocably changed. Armed with hard-won information about herself and her past, she prepares to leave War Creek and find her mother and her child. 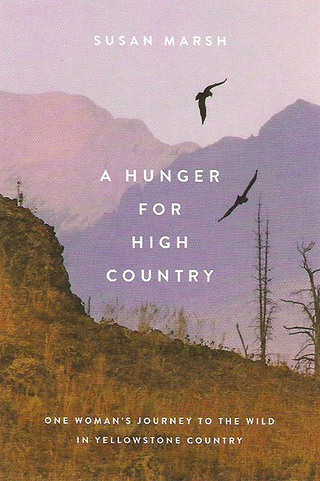 A Hunger for High Country is a memoir with a mission. On one hand, Susan Marsh shares her romantic notion of the wild places of Montana and Wyoming with descriptive detail. On the other hand, she shows us her strength in her quest to find her place among the male-dominated hierarchy of the National Forest Service (NFS). In this hybrid memoir and scientific report, the author provides insight into the status of federal wilderness lands as our nation transitioned from managing public lands to preserving them. The shift that began in 1964 with the Wilderness Act, signed by Lyndon Baines Johnson, has been a slow one. An inherent conflict pits "amenity" resources like recreation, wilderness and scenic quality against the status quo of utilizing national forests for commodities like timber, minerals and grazing. The old-guard bureaucracy has held on tenaciously for five decades, regardless of new laws enacted. A baby-boomer, Marsh grew up playing in the woods rather than playing inside with dolls. Even though she had few women role models, she chose a career in environmental conservation. Women in the 1980's were expected to "smile and be pleasant" to have any hope of a career with the National Forest Service. She persisted and wrote, "Yet the longer I stayed the more I loved the forest and it occurred to me that loyalty to a place, a relationship with the land, were more important that moving on to further one's career." If you are a reader who is interested in women who pioneered in fields that are not typically pursued by women, her story is unique. If you are intrigued by the area she calls "The Park" and the area surrounding Yellowstone (like Bozeman, Montana or the Grand Tetons and Jackson, Wyoming), there are plenty of accounts of these places as she travels on foot and horseback, and she includes black and white photos from those trips. But vast tracts of federal wilderness lands remain at risk even after 50 years of attempts to preserve them. An alarming trend is to turn over stewardship to states and private contractors who use up natural resources as "commodities." "We've grown to accept, or even expect, a theme park rather than the wild. Without authentic and individual experience, without the practiced intimacy needed to grow a personal relationship with real places, we cannot muster the visceral allegiance to them that is so urgently needed. I worry that the lack of intimate knowledge of the outdoors and its attendant quiet will make us simply forget about both. Silence will go the way of the Dodo, unnoticed and unmourned." We owe a debt of gratitude to forest workers like Susan Marsh whose tireless efforts have resulted in victories of preserving wild lands that are "outstandingly remarkable." An illustrated guide and celebration of the natural wonders of Cache Creek, in Jackson Hole, Wyoming. The Wild Wyoming Range is a hardcover coffee-table book featuring photographs and essays, co-edited with Ronald Chilcote and published in 2013. Targhee Trails and Beyond the Tetons are regional books with maps and photos, natural history and historical vignettes in addition to basic trail information, co-authored with Rebecca Woods. Anthology of nature writing and art by contemporary authors and pioneering naturalists of the early 20th century.